Use the finest steel wool you can find — four ought steel wool. (0000) Make sure these are the numbers on your steel wool package as there is a difference between 4 ought (0000) and 3 ought (000). This will make sure the rough surface of the wool is extra gentle on your windshield and leave you with an incredibly smooth finish. 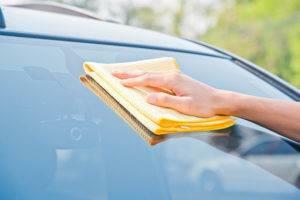 Step 2: Soak a rag in Rainx and clean the entire windshield with the cloth. Make sure this does not get on your vehicles paint. Has anyone tried this technique? What were your results? *Disclaimer: Milnes is not responsible for the results of experimenting with this technique.